PLANO, Texas--(BUSINESS WIRE)--Aug. 13, 2018-- Cinemark Holdings, Inc. (NYSE: CNK), a leader in the motion picture exhibition industry, will open a new 13-screen theatre in Rialto, California, on Thursday, Aug. 16, 2018. 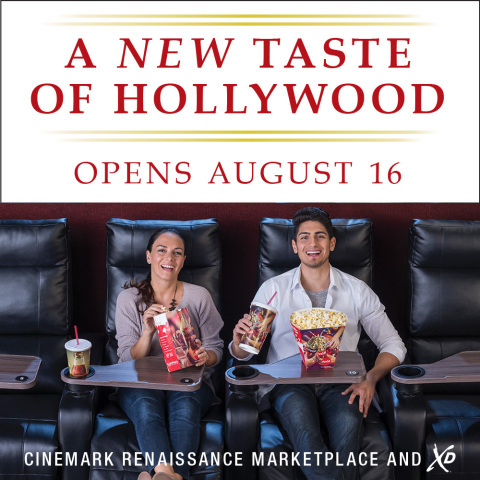 Located at 1355 W Renaissance Parkway, the new Cinemark Renaissance Marketplace and XD theatre will feature Luxury Lounger electric recliners in all auditoriums, a Bistro with an expanded menu and an XD: Extreme Digital Cinema auditorium. Tickets are now available at Cinemark.com. To further enhance their entertainment experience at the new theatre, moviegoers can sign up for Cinemark Movie Club, a unique monthly movie membership program offering ticket and concession discounts along with other exclusive benefits for just $8.99 per month. Movie lovers can instantly join and begin taking advantage of their benefits at all Cinemark locations by downloading the Cinemark app or by visiting cinemark.com/movieclub. In the upcoming weeks at the Cinemark Renaissance Marketplace and XD theatre, Guests can enjoy a variety of Hollywood’s blockbusters including Mission Impossible: Fallout, The Meg, Crazy Rich Asians, Alpha, Mile 22, Christopher Robin and more. A party room available for rental for birthday parties and other celebrations. The new Cinemark Renaissance Marketplace and XD theatre will officially open their doors to the Rialto community with the Grand Opening event on Thursday, Aug. 16. There will also be live radio station remotes with Kid Jay from 99.1 on Thursday, Aug. 16 from 5-7 p.m., Jesse Duran from Kola 99.9 on Friday, Aug. 17 from 5-7 p.m., Kelli from K-FROG on Saturday, Aug. 18 from 1-3 p.m. and Mayra Berenice from José 97.5 on Saturday, Aug. 18 from 3-5 p.m. Each station will be giving away special prizes throughout the afternoon and evening.